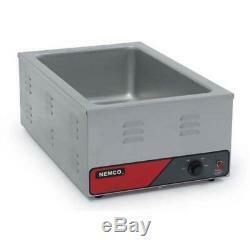 Nemco Food / Soup Warmer, Full Size. This quality food warmer is made of heavy duty stainless steel. It is mirror polished with ventless bodies, making it not only easy to clean, but also looking great for front-of-the-house duty. Its thermostatically controlled heating elements ensure longer life, faster warm-ups and efficient use of electricity. 14-5/8"W x 23-7/8"D x 9H. Water resistant on/off switch cover. 65 cord with 3 prong ground plug. The item "Nemco 6055A Food / Soup Warmer, Full Size" is in sale since Tuesday, November 10, 2015. This item is in the category "Business & Industrial\Restaurant & Food Service\Commercial Kitchen Equipment\Cooking & Warming Equipment\Steamers & Steam Cooking". The seller is "bakedeco" and is located in Brooklyn, New York. This item can be shipped worldwide.